Ski Apartment In Trois Vallees. 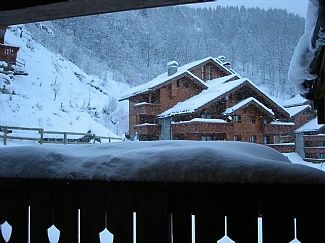 Apartment in Meribel Village, Les Allues, Savoie, France - 3 Minutes Walk To Ski Lifts And Services. A well-equipped ski-apartment in Meribel Village within a short 3 minute walk of the Golf high-speed chair lift taking you directly into the enormous Trois Vallees skiing region. Also within 3 minutes of bakery, ski hire shop, ski pass office, two restaurants and supermarket. The apartment is well-equipped, with flat screen TV, DVD player, free internet access, oven, microwave, washing machine and washing-up machine. We are a professional couple living in London. We bought the property as a holiday apartment for ourselves, as the whole family are very keen skiiers. We bought it because it is convenient for skiing and the shops, in a quiet location. We particularly enjoy the ability to walk out of the apartment to go either downhill or cross-country skiing without taking buses or using a car. Bedroom 1 has en-suite shower cubicle and basin. Separate WC on ground floor. Bedrooms 2 and 3, which are on the upper floor, share a separate bathroom with bath and shower over, basin and WC. Large kitchen/living/dining area with oval dining table. Cupboard which houses washing machine. Hanging area for coats. Sofa. Flat screen TV and DVD player. Free broadband internet access. Leads onto balcony with view of mountains. The apartment is in the Trois Vallees skiing region, one of the largest connected ski areas in the world. There is a ski hire shop within 3 minutes of the apartment and you can purchase ski passes from the bottom of the Golf lift. Ski-school meets at La Chaudanne in Meribel centre, which is a 5 minute free bus ride/drive away. Skiing starts from the Golf lift, a high speed, 6-person chair lift which is a 3 minute walk from the aprtment. From the top of that lift you can choose to ski to the centre of Meribel, or on up the Altiport 8 person chair towards the Dent de Burgin, Adret and Burgin Saulire lifts. Access to the Courchevel valley can be via the Col de la Loze chair, or via Burgin Saulire. You can also reach Val Thorens and the Fourth Valley by descending into Meribel and taking the Platteret gondolas. At the top of the Meribel valley is Mont Vallon, with its two long descents. Cross-country skiing is also possible in number of locations in Meribel. Utility Room: Separate ski and boot locker on lower ground floor of building Cleaning / Towels / Linen / Maid service: Linen and towel hire included. Other: Large landing area upstairs. This is a good apartment in a super location in Meribel Village but it could be so much better if it had a welcome pack, for example soap, and basics like tea, coffee, sugar, salt pepper etc, we got there late and shops all closed so nothing to eat or drink until the morning. Also the instructions given would be helped greatly with a few photos, the descriptions of how to do things are not easy to follow for example turning on the hot water. Overall a great place to stay if they could fix these small issues. Glad you appreciated the apartment and the location. I will think about the small points you raise, including putting photographs of the hot water switches in the instructions. It is always possible to request us to obtain some groceries for your arrival if that is what you wish. Salt and pepper, and a supply of bin bags, washing up liquid, laundry liquid, dishwasher tablets and cleaning preparations are always left in the apartment. I am glad we were able to help you directly with the query you raised about the hot water. The photographs just don't do this apartment any justice. It is very homely, comfortable and exceptionally safe. Christopher has been excellent both prior to and during our stay everything worked really well, keys were readily available. Meribel village is an exceptional spot, we have stayed here frequently and enjoyed the apres ski at the lodge de village as well as the superb bakery, this apartment though is the right end of town and was exceptionally quiet. The descent in the morning to the Lapin lift is easy and even after a full days ski returning to the apartment really isn't an issue. A lift to the apartment is also a bonus. Having stayed with 2 teenage boys 2 toilets an ensuite in the master bedroom with a shower and a family bathroom upstairs for the boys was perfect. All home comforts are available and cooking facilities as well as availability of washing and drying options make the whole holiday really manageable. I'd book again no problem and intend to do just that. Many thanks. Glad all went well with your stay. I look forward to welcoming you again soon. Chris was really helpful with all of the stages leading up to our arrival, and everything went very smoothly. The apartment has everything that you need for a comfortable and enjoyable week. We were a family of 5 and loved this apartment. 2 bathrooms was ideal for teenagers and sitting room was very comfortable. The kitchen had everything we needed including a teapot! Handy for the slopes, quiet and lift for the end of the day. Hope to be back. The nearest airports are Chambery, Grenoble, Lyon and Geneva. The first two are just over an hour away, Lyon is about two hours and Geneva slightly more. There are train services to Moutiers, either direct or via Paris. There are buses from Moutiers station to Meribel, or it is a 20 minute taxi ride. The distance from the Channel Tunnel is approximately 600 miles (1000 km). Meribel is about 15 km from Moutiers, the nearest reasonably large town. Courchevel is also easily reached by road. A bar and two restaurants in Meribel Village. An excellent bakery and a small supermarket all within a short walk. Ski hire and fashion shops. Booking Notes: £100 to secure booking. Full payment required 28 days before start of rental Changeover Day: Changeover day is normally Saturday. Check out by 10 and in after 4 pm.